Dennis of Birch Street Uptown Lounge surveying the process thoughtfully as he caramelizes a sugar rim. A couple Mondays ago I consumed a little too much Chief Factor’s Favorite at English Estate Winery which led to a synergistic visit to Birch Street Uptown Lounge. First, let me defend myself—or excuse myself, depending on your perspective—by stating that the Chief Factor’s Favorite is drinking so smoothly right now. The current blend of estate-grown pinot noir, estate-grown cabernet sauvignon and a bit of cabernet franc is a little dangerous, Andee Mowrey is extremely personable and my husband was trading war stories from his time working at North Country EMS with a local firefighter who also cut his teeth under the capable direction of one Tom McDowell (amazing how I wove all that together). So it was that I mentioned to Andee I’d never actually been to one of Dennis Kinsey’s weekly wine tastings although I’ve enjoyed the Prohibition-era ambience of Birch Street Uptown Lounge on several occasions. I soon found myself bellying up to the bar of this classic cocktail lounge in downtown Camas only to be told, since we’d just come off Easter weekend, he’d cancelled the tasting for Sunday and Monday. Never fear, however. Dennis, always eager to be accommodating and share his vast knowledge of vino, disappeared for a few moments and came back with a selection of Australian winners. The lineup of Australian wines for our spontaneous Monday night wine tasting presided over by cocktail extraordinaire, Dennis Kinsey. The lineup was a little untraditional because we surprised him and, being a master at his craft, he wanted to be sure the white was well-chilled before pouring it—a true pro. Heartland’s 2012 Shiraz from Langhorne Creek - South Australia has an intense color that immediately suggested plum to blackberry flavors and the nose smelled like warm blackberries just picked off a sun-soaked vine. It had a tight feel to it so the more aerating, the more this wine’s bound to give. Would be a nice accompaniment to their pulled pork sliders. Southern Australia is noted for their Shiraz but the Barossa Valley is world-renowned and the difference in the Yalumba 2012 Patchwork Barossa Shiraz was immediately apparent with a more complex aroma that gave way to dark cherry and earthiness with a hint of leather and coconut. Its deep tannins and savory notes paired nicely with the skewers we ordered—half salami, roasted red pepper and artichoke and half tomato and mozzarella drizzled with pesto sauce as well as a mix of olives. Yalumba’s 2012 Patchwork Barossa Shiraz savory notes and deep tannins paired nicely with the skewers we ordered—half salami, roasted red pepper and artichoke and half tomato and mozzarella drizzled with pesto sauce as well as a mix of olives. Even tasting it a little out of order the floral nose that riesling is known for was evident in the Pewsey Vale 2013 Eden Valley Dry Riesling and I detected citrus—more akin to orange than lemon/lime—on the palate. I wouldn’t have hesitated to pair the acidity with their gourmet mac & cheese. Of note: Eden Valley is particularly well-known for standout dry rieslings. So there you have it. Thanks to Andee, I can finally say I’ve experienced a Birch Street wine tasting. 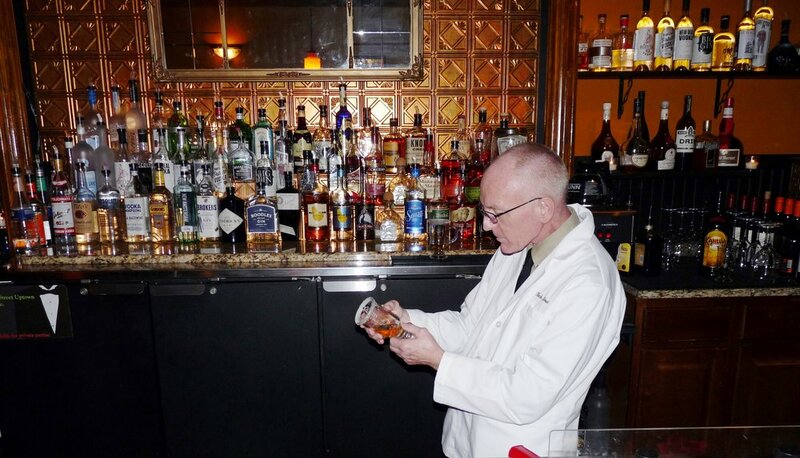 Dennis pours as much of his heart and research into this weekly event as he does making stellar, top-shelf vintage cocktails. Thank you, Kevin, Ron and Dennis for your true craftsmanship and dedication to keeping a bygone age alive. One of these weekends I need to check out the live jazz!